Hasha Video Chat 1.3 is software designed on Adobe Flash technology. 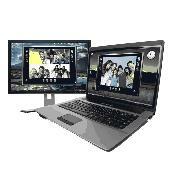 It provides environment and features to enable interactive multi user audiovisual and text communication. Hasha Video Chat 1.3 also offers a simultaneous translation enabling feature which allows interpreter connection to ongoing Chat session.